Since 1983, Zachary’s has been making award-winning pizza in the San Francisco Bay Area. When Zachary’s founders, Zach Zachowski and Barbara Gabel, decided to retire, they sold the company to the employees via an Employee Stock Ownership Plan (ESOP). In 2010, Zachary’s became 100% employee owned. Our employee owners are the mojo behind the madness. They make each of our restaurants unique, fun, and delicious. 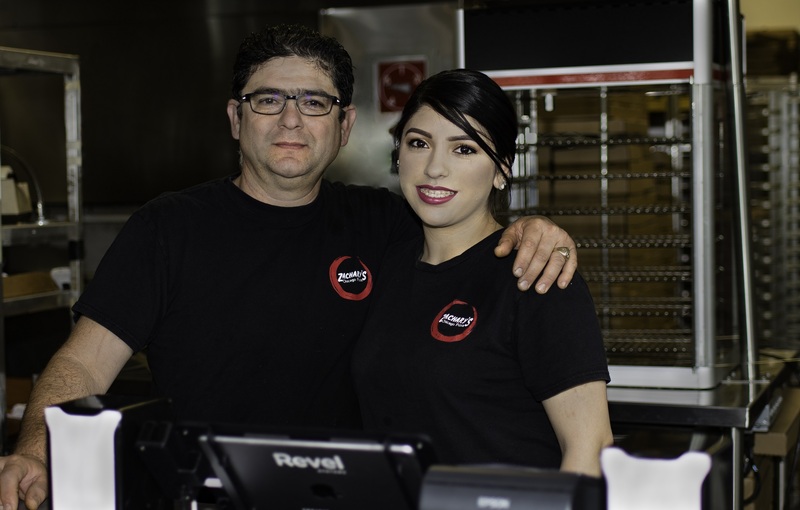 This month, we are turning our attention to Antonio and Adanely Beltran, a father/daughter duo who both work at our San Ramon location! Christina (C): What are your hire dates? Adanely (AD): For me, I don’t know the exact date, but I think it was June 2015. C: Okay, so you (Antonio) had already been here for nine and a half years before Adanely started? C: What’s your favorite pizza? C: Do you make Adanely special pizzas? AD: And he adds some spices that he brings from home. C: Oh! What are the spices? Or, is it your secret recipe? C: Sound good. And where are you both living right now? What city? C: Do you live together? C: Great. [To Antonio] How did you discover Zachary’s? AN: My friend. We were working together in another job and he told me. He told me they needed a lot of people. You know when this (San Ramon) opened, we needed a lot of people. I talked to Kevin (Kevin Suto is Zachary’s President and CFO). He gave me the job. C: He interviewed you? Do you remember what he asked you? 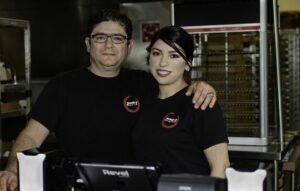 AN: Oh my gosh… He asked me, “Where do you work?” “Do you work in a restaurant?” He asked me, “Have you made pizzas?” I said, “Never!” He said, “Do you know the (ingredients) pepperoni, pineapple, cheese, and salami?” He said, “It’s okay. You got the job!” And I started. On the same day. C: You started on the same day that he interviewed you? AN: Yes! There were too many people! C: Oh, that’s right. It was crazy when San Ramon opened. C: Did you start right when we opened? AN: [Makes huge eyes] Very hard! Crazy! You know, I had never made pizzas. This was my first time, so it was very hard for me. The pan pizzas… my hands hurt. Oh my God… it was painful. Too many nights… In the night time, for a month, I had a lot of pain. [Motions to his hands aching]. C: Now your hands are probably really strong. C: That’s pretty cool! Why did you think that this would be a good job for Adanely? AN: Because of professionalism, the environment, there was no bullying. And there was a lot of respect between people. Especially compared to other places, it’s very respectful among coworkers. Also because we were going to be working together. I had been working a lot of years for a long time and I was away from home. I liked the fact that we were going to be together, working. C: What is working together like? AD: It’s fun. Uh, he helped me a lot when I first started. He told me what to do and guided me on the right track. We get to spend our breaks together sometimes, so he makes me food. Like he said, we didn’t get to spend a lot of time with him when he was working both of his jobs. Here and his other other job. So, we were spending more time together. C: Do you have other siblings? AD: I have a younger sister. Right now she’s 16. And then I have a brother who is 19. C: [To Antonio] Would you want to work with them too? AN: I would like her to work here. I would like it. I want to say thank you. I am very thankful for the opportunity that Zachary’s gave us. We are growing and learning every day. I am thankful for our future. And you are giving her [Glances at Adanely] an opportunity to grow. C: Is there anything that is challenging about working together? AN: Ah no. We are in different positions so we if we do something wrong, we have to take responsibility for it. AD: Yes, like he takes his responsibility, I take mine. We’ve never had a moment. C: It seems really cool to spend a lot of time together, but then if there were any conflict or drama outside of work, I can imagine, for me, that would carry over. AD: Yeah, but we don’t. We don’t. C: Do you talk about work when you are at home? AN: We try not to. C: You keep it separate? 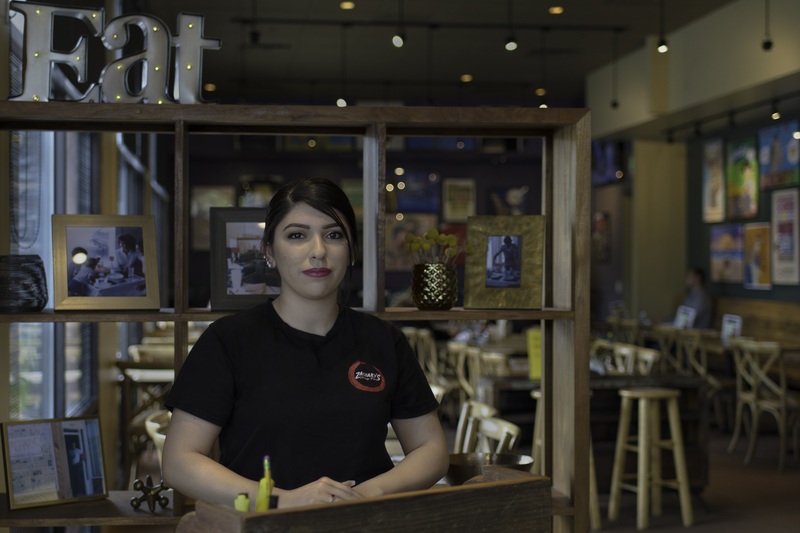 C: (To Antonio) What is your favorite thing about working at Zachary’s and/or working with Adanely? C: You gotta make the money! C: [To Adanely] What’s your favorite thing about working here? AD: It’s very team oriented. So, if you are having trouble with something, especially serving, there is someone right there to help you all the time. We try to make it as least stressful as possible. Helping your coworkers out too… You help them and they help you. Um… everybody gets along. The managers are pretty cool. [Laughter] I talk to everybody, even in the kitchen. It’s just very friendly. C: Do you all cook at home together? C: Do you (Antonio) do most of the cooking? C: What are your favorite things to make? AN: Yeah, everything… pasta… Well, I don’t make pizzas! [Laughter] Pasta and steaks, chicken… oh my God. AD: I think steaks is what he makes the most. C: [To Adanely] What is your favorite thing that he makes? Other than that pizza? AD: Yeah, that’s my favorite thing. AD: Everything that he makes is so good. It’s delicious. C: Your house is a gathering space for people? C: Because you are producing all of that delicious food! AN: In my morning job, you just have to learn everything in a week or two. They just throw you in there and you have to figure it out and deal with it. You have to do what you can. You have customers in front of you and you just have to figure it out. But here there is a process. You have two or three months and then you have to know. C: What do you all do for fun outside of Zachary’s? AN: For fun? [Laughter] When we take vacations, we try to go places. To Magic Mountain and Las Vegas! But the days that we have off, we have dinner at home and try to get together. We always try to eat together. C: With your whole family? C: If you could have your ideal work situation, would you keep working together? Do you see yourselves not working together in the future? If you could dream it, what would it be? AN: We don’t know because Adanely is in school. AD: Yeah, I’m in school and I have a career in mind, so we don’t know. But it would be nice to work together all the time. AD: Yeah. We just have a good time together. We never argue. But, he’s going to stay here until who knows… but I’m going to school, so I don’t know what the future is. C: What are you going to school for? C: What kind of nursing do you want to do? C: Fun. [To Antonio] So you are not interested in nursing? C: Great. I think that’s all of my questions. Do you want to say anything else about working together? Or working at Zachary’s? AN: I am very thankful because these past eight years, we were in a very difficult situation together. But this job keeps us together. C: I think it’s really unique and special that you want to work together and that you are able to make it work with your schedules and all of the other stuff going on in your lives. It’s really special that you can enjoy the time that you have working together. It’s really sweet. AN: Thank you, thank you. And many thanks to Kevin and Leandra (Leandra is Zachary’s Vice President and General Manager). C: What was Kevin like in 2006? AN: No, he was the same. He is always a friendly person. He always says hi. A lot of people get nervous around him, but I think he is a friendly guy. I think because we are the same age, it’s a different type of vibe. C: You can relate to each other. AN: And I’m thankful that he gave me this job. C: Do you have any pictures of yourselves when you were younger cooking together? AD: My mom took pictures of him cooking… but not us together. I don’t know. I’ll see. She’s gonna be like… she never cooks. C: [To Adanely] You never cook? AD: No, he always cooks. Laughs. C: What do you do when he is not there? AD: I’m always working. We’re always working. Or my Mom cooks. I never cook. C: What are you going to do if you’re living along? AD: I’ll just take him with me. C: Awww, that’s pretty sweet that she wants to take you with her wherever she goes.